tour from their first day in-country until their last. ordinate units, geography, and areas of operation. drastically with the new concept of the nonlinear battlefield. and-run guerilla warfare by an always-elusive enemy. subordinate units affected the overall war effort. a combat support as well as service branch. upon for support. At the time there was no precedent for it. strike capability of Long Binh Post and USARV. 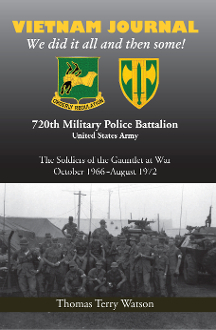 Group’s go-to battalion, the 720th. service to be proud of.